It’s exciting to drive a new car, especially when that car is a Land Rover. But how can you make sure that excitement lasts? Here are recommendations that will help keep your Land Rover in top condition and extend its life indefinitely. Although today’s cars and especially Land Rovers have been designed for maximum performance with lower maintenance than cars of days gone by, that also means the maintenance your Land Rover does need is even more crucial. The first step is to follow the service schedule that came with your car. Take advantage of the technology that is part of your Land Rover and be sure to pay attention to all service reminders in the multifunction display. Taking your car to the authorized Land Rover service department without delay will go a long way to extending its life. Land Rover power plants, like all engines, depend on effective lubrication to function efficiently. Regularly check the oil in your Land Rover each time before refueling. Do not allow the oil level to fall below the minimum mark, and change the oil at the intervals recommended for your Land Rover in the owner’s manual. The multifunction display on your Land Rover gives you the ability to check oil levels without having to pull out a dipstick or mess with an oily rag. Check the instructions for your particular model. Check your tire pressure at least monthly when cold and keep tires inflated to the inflation pressure recommended by Land Rover on the tire inflation pressure label posted in the vehicle. This not only ensures your safety, but also it helps maintain best performance. As an added safety feature, modern Land Rovers are equipped with a tire pressure monitoring (TPM) system with a low tire pressure warning light that illuminates when one or more of your tires is significantly under-inflated. Accordingly, when that warning light comes on, stop and check your tires without delay, and inflate them to the proper pressure. Driving on a significantly underinflated tire causes the tire to overheat and can lead to tire failure. Under-inflation also reduces fuel efficiency and tire tread life, and may affect the vehicle's handling and stopping ability. Starting a cold engine, when lubricants are not immediately flowing to every part, is when most engine damage occurs. It only takes a few seconds after start-up for the oil pump to adequately lubricate an engine, but during those few seconds, you should keep engine rpm in the lower ranges. You don’t need to idle for a long time to “warm up” the car, but for maximum lubrication, give the engine at least 30 seconds before engaging gear and driving off. 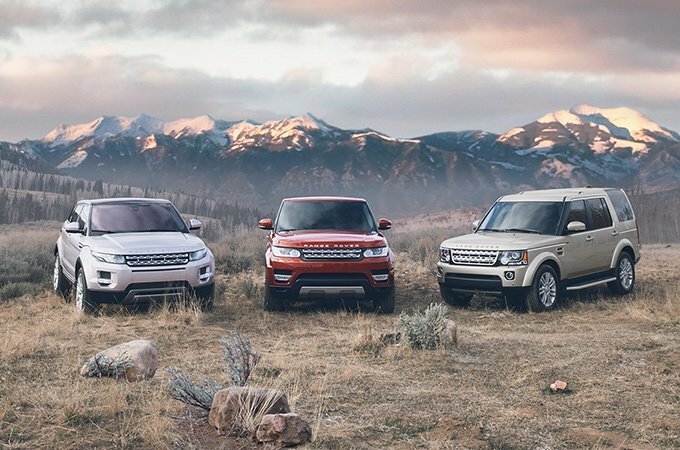 Land Rovers are designed for spirited driving, but there are driving strategies that boost performance better over the long haul. Sudden stops add extra wear and tear, so look ahead to anticipate braking situations. Drive in a steady and consistent fashion to help extend the life of the car. For example, make sure you are completely stopped before shifting in reverse. Experts say calm driving boosts fuel economy by as much as 35 percent. Your Land Rover was made to be driven, and it will do better if you avoid short trips, especially in cold weather. When your car is first started, more fuel is mixed in to get it running. Also, water is generated as a natural byproduct of engine combustion. Some water gets into your car’s oil and exhaust system every time the engine runs. On a longer trip, your car’s engine gets hot, and the water and unburned fuel are boiled out of the oil, your engine and your exhaust. But this cleansing action won’t happen on a short trip, allowing the water and oil to eventually turn into engine-killing sludge. So, how short is too short? It varies by temperature and how you drive, but it’s a good idea to avoid trips of less than five miles in normal temperatures, or less than 10 miles in freezing temperatures. Just as pilots make a careful preflight before each flight, you should do an extra thorough walk-around check of your Land Rover at least once a week. Walk around the car slowly and look for any body damage that might require touchup. Have an assistant help so you can check that all the lights and signals are functioning correctly. Whenever you drive, use your senses to try to detect anything unusual. The most obvious is sound. Turn off the radio and listen to your Land Rover. If you hear anything besides the legendary Land Rover engine music, talk to your Land Rover mechanic. Similarly, if you suddenly smell anything unusual, such as a burning smell, have it checked out. Wash road salts and other grime off your paint and undercarriage to prevent corrosion and extend the life of paint. While commercial car washes are fine, you yourself should wash your Land Rover yourself at least once in a while. That way you will notice little things like cracked lenses or minor paint chips before they become a more expensive problem. Regular waxing also helps protect your paint and make that beautiful Land Rover look last. If you live in an area where salt and other corrosive chemicals are used on roads in wintertime, seriously consider a professional rustproofing treatment. Check with your service adviser to see what they recommend. When it comes time to repair or replace parts on your Land Rover, use only genuine Land Rover parts, whether new replacement parts or Land Rover remanufactured parts. Only genuine Land Rover parts are guaranteed to meet original Land Rover specifications for maximum performance and long life.